Mondrian’s simplicity is its strength. Its pared down geometric structure emerges like a taut line of light. 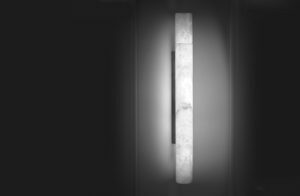 Vertically, its lines form a wall lamp (sconce); horizontally it evokes a shelf.